People flocked in their thousands to the Victorian goldfields, armed with the tools to dig for fortune. One man, however, came with brushes and paint. Connor Amor-Bendall continues our Graveyard Shift series of lost stories from the Melbourne General Cemetery. Diggers on the way to Bendigo, ST Gill, 1869. Credit: State Library of Victoria. Among crumbling graves, adorned with a dusting of moss and a lone glass vase, sits the monument honouring Samuel Thomas Gill. Although the grave of “The Artist of The Goldfields” sits rather unnoticed, camouflaged within the Melbourne General Cemetery, his artistic legacy is not. Gill’s contribution to the documentation of Victoria’s gold rush is considered by experts to be unsurpassed by any other artist. His paintings and sketches preserve a momentous period in the colony’s history. After the discovery of gold in the early 1850s, Gill spent 20 years documenting the changing face of the Bendigo Goldfields, in doing so publishing many lithographic series that were published in Australia and England, most notably in The Australian Sketchbook and Victoria Illustrated. Gill was born in Somerset, England, in 1818. He moved to Adelaide in 1839 where he established himself as a watercolourist and draftsman. He was a large-framed man with a mane of red hair and a convivial nature. He had a lust for life that led him to join the gold rush, armed however with paint brushes in place of a shovel, earning the title of “The Artist of the Goldfields”. Gill’s success as an artist came from his intimate relationship with his subjects, which transcended into his sketches. He visited the saloons and grog shops of small settlement towns such as Ballarat Flat, Ironbark Gully, Bendigo, and Forrest Creek. 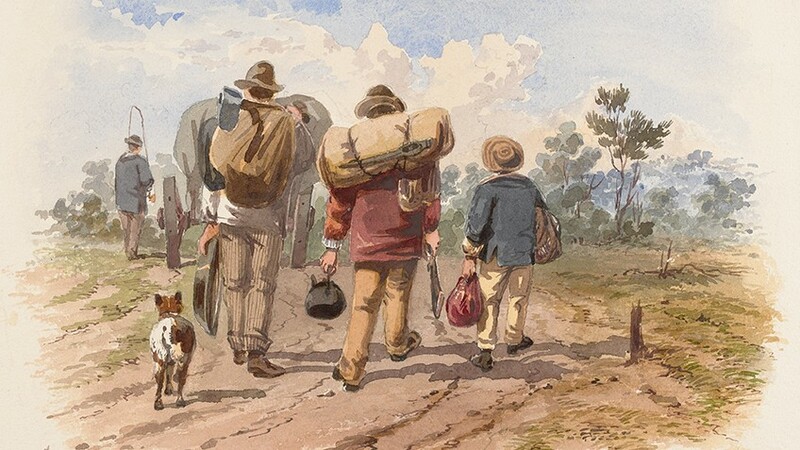 Paintings such as Dish Washing, Fossicking and A Diggers Auction showed the ins and outs of a gold digger’s life that Gill experienced, from mundane tasks to the enticing rush of gold. By the 1860s, Gill was established and successful as an artist, with a house in Little Collins Street and apparent wealth. He published nine volumes of sketches, and his work can be found in state and national libraries in Australia. His words imbued the society to transfer Gill’s remains to a private grave and erect a headstone in Melbourne General Cemetery in 1913. Today the stone stands forgotten and decaying, an appropriate ghost of the man it represents. Despite his success, Gill slipped into the habits of “habitual drunkenness”. The Melbourne of the fifties and sixties presented many temptations to those of a bohemian spirit, as the Cafe de Paris, Dancing Rooms and Theatre Royal bars were in full swing. Gill’s artistic prowess began to suffer alongside his indulgent lifestyle, with the quality of his work decreasing due to a shaky hand, identifiable in the distortion of line and brush stroke seen in his later works. Arthur Peck, a Melbourne architect of the mid-1880s and friend of Gill’s, contracted Gill as a draftsman on many an occasion. He reported on the demise of his craftsmanship, and inevitably the demand for Gill’s work soon disappeared. In the last years of Gill’s life, it seems he became something of a public menace. An article in The South Australian noted his appearance in court for owning a dog which attacked and lacerated an Aboriginal woman, Ngungu Ngammin. He was reduced to bartering his sketches for drink, often visiting the Mitre Tavern, according to Peck. On the Wednesday afternoon of October 27, 1880, Gill, aged 60, was staggering drunkenly down the steps of the Melbourne General Post Office before collapsing to the ground, where he lay in a comatose state, according to The Melbourne Argus. He was rushed to hospital only to be pronounced already dead due to the rupture of an aneurysm of the aorta.